The Mojito is the comeback cocktail. As tasty as it is trendy, it is often referred to as a favorite beverage of author Ernest Hemingway, and was voted the most popular cocktail in Britain and France in 2016. We simply refer to it as Garden Inspired Greatness. This Green Tea & Orange Mint Mojito is a unique twist on the traditional Cuban cocktail. Dress it up or make it casual by changing the glass you serve it in, and rim your glass with some colored cane sugar to impress your dinner guests. 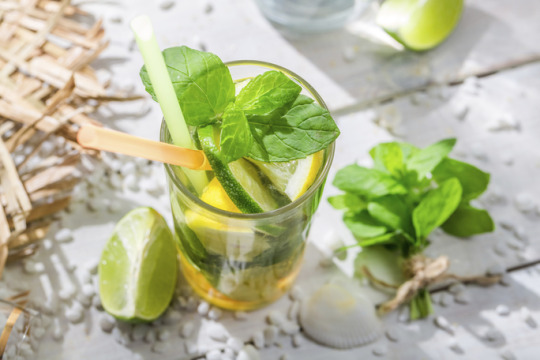 For our non-drinkers, omit the rum for a divine iced lime and mint green tea! 1. Muddle the lime juice, mint, and sugar together until the flavors release. Add ice until glass is about ¾ full and then pour in rum and green tea. Stir thoroughly. 2. Garnish with lime wedge and fresh mint. November 14, 2017 by Corinne L.